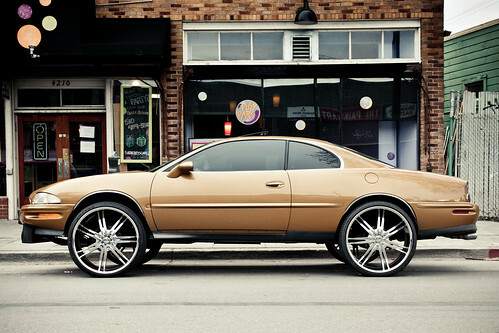 Scrapers (as opposed to scraper bikes) are cars, generally American-made, but in Oakland often Lexus-es, customized with any number or combination of the following: fancy, usually oversize rims, tinted windows, bright/sparkly paint and/or beats. Rapper E-40 has a song with the lyrics "sittin' in my scraper watching Oakland gone wild." CC SA-BY Our Oakland photo CC BY-ND 2.0 by Nick.Fisher badly scraped scraper, near Piedmont Ave.